(SAVANNAH, GA) Junkluggers of the Coastal Empire has selected Marine Toys for Tots as their charity partner for the month of December. Savannah’s eco-friendly and caring alternative to traditional junk removal will assist in the collection of more than 75 cubic yards of toys this holiday season. 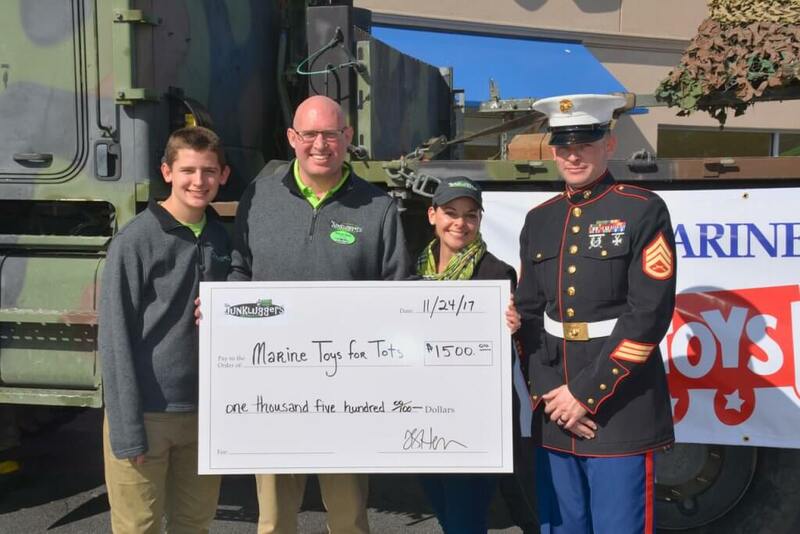 To kickstart their partnership with Marine Toys for Tots, Junkluggers presented a $1,500 check to the organization on Friday, Nov. 24, at 11 a.m. during their Black Friday event at Toys-R-Us, located at 7400 Abercorn St in Savannah, Ga.
Marine Toys for Tots is collecting toys for children in need to brighten their Christmas season. This year, the organization will participate in approximately 45 events in which local citizens can drop off toys. The collected gifts will, in turn, be distributed through local non-profits, including the Salvation Army, United Way and a few churches. During November and December, Hess and his wife, Misty, who is also his business partner, will be asking customers to participate by donating toys at the time of service. Junkluggers will also help move toys from two major events, one at Sun City in Bluffton and the other at Silver Moss in Hilton Head, to local holding stations. Hess previously served in the U.S. Navy and is currently continuing service as a member of the Navy Reserves. Junkluggers hauls away items people no longer want or need and strives to donate and recycle as much as possible with the goal of keeping items out of landfills. The local franchise recently celebrated its grand opening and wants to start the business by giving back. The mission of the U. S. Marine Corps Reserve Toys for Tots Program is to collect new, unwrapped toys during October, November and December each year and distribute those toys as Christmas gifts to less fortunate children. This year, Marine Toys for Tots will collect toys until Dec. 14. For more information, please call 912-712-0227 or visit www.junkluggers.com. MY SAVANNAH™, maintained by Carriage Trade Public Relations™, is a distributor of content sometimes supplied by third parties. Any opinions, advice, statements, services, offers, links, and information made available by third parties do not necessarily state or reflect those of the company.